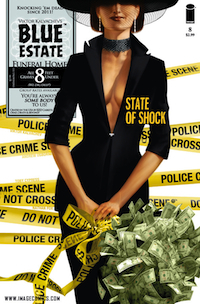 Ever since I began reading Blue Estate it’s felt like with each new issue I’ve been holding my breath waiting for a lull in action or dialogue, or anything to give me a moment’s rest. 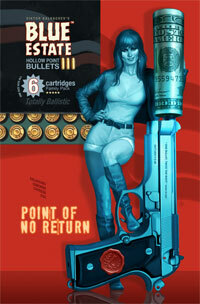 Since issue #1, Blue Estate has been delivering a virtually unending line of pulp action and Blue Estate #6: Point of No Return is no exception. 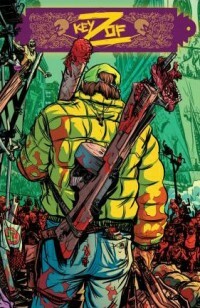 From the start, creator Viktor Kalvachev and his five-man team have made it their personal mission to drag us as readers down into the literal hell that is Los Angeles on the brink of a gang war. In Blue Estate #6 we are introduced and reacquainted with some of L.A’s worst, but instead of pulling us out of the cesspool, Blue Estate grabs us by the throat and yanks us in deeper.